Built in 1970, the Pavilion Building is a companion to the adjacent Mercantile Bank & Trust building – both designed by architects Peterson and Brickbauer. Once home to the stylish Schrafft's restaurant, the Pavilion is now home to the City Plaza Medical Center. One of the last buildings to be erected around Hopkins Plaza, Pavilion Building on Liberty Street was constructed in 1970. Built by the Manekin Corporation, the structure was planned as a bank for the Mercantile-Safe Deposit & Trust Company. The bank had just moved into a new 22-story tower just north of the Pavilion, designed by the same architects Peterson and Brickbauer who designed the 2-story Pavilion with a transparent glass-clad exterior from the base to the roof. The complex of both buildings received an AIA Honor Award in 1972. Shortly before construction began, the plans shifted from retail bank to restaurant with Schrafft's chain restaurant occupying the first floor of the $1 million building. The Manekin Corporation planned to lease the second floor of the building as a small shopping center to serve visitors to Hopkins Plaza and office workers around Charles Center. Conveniently, a pedestrian "link" connected the Pavilion to the adjoining Mercantile building up until the walkways were dismantled in the 1990s and 2000s. When Schrafft's restaurant opened at their new location in 1971, they advertised a rich meal at a bargain price, boasting: "It's mountains of salad at no extra cost, "say when" drinks, individual loaves of hot bread, and 15 tantalizing relishes. Complimentary cigars and candy mints for after dinner. Plus a sumptuous appetizer, a delightful glass of wine and a famous Schrafft's dessert, all included with dinner. And all located near theaters, movies, shopping and sports events. Everything from as little as $3.95." Founded in Boston as a candy company in 1861, the Schrafft's began opening restaurants in and around New York in the 1950s. As they expanded into cities across the northeast, Schrafft's acquired a reputation as an upscale and tastefully decorated establishment, perhaps equivalent to Starbucks in the present. Unfortunately, as the 1970s continued the chain began to struggle and the Hopkins Plaza location closed within just a few years. Most recently, the Pavilion Building was occupied as the City Plaza Medical Center operated by Kaiser Permanente. 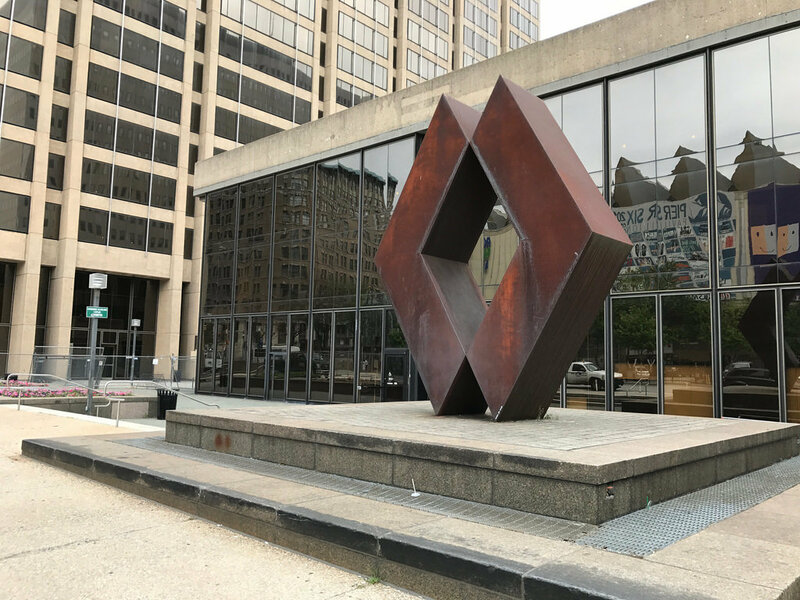 Eli Pousson, “Pavilion Building at Hopkins Plaza,” Explore Baltimore Heritage, accessed April 23, 2019, https://explore.baltimoreheritage.org/items/show/502. Published on Mar 31, 2015. Last updated on Nov 27, 2018.